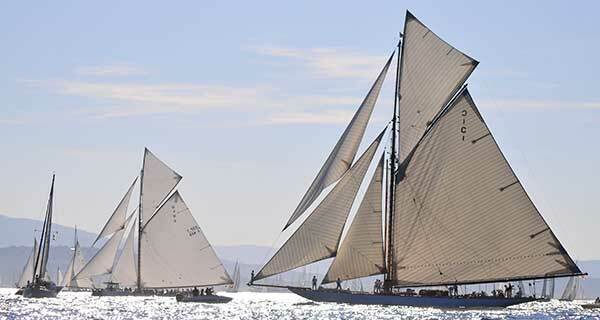 Once a year, the world’s fastest and most beautiful classic yachts meet in the small and somewhat dozy town of Antibes at the French Mediterranean coast. Located right next to Cannes, the old seaport of Antibes, Port Vauban, then becomes alive with cocktail parties, barbecues and live music. It is June – and this marks the beginning of the classic yacht season in the Mediterranean Sea. Les Voiles d`Antibes presents the Grand Opening of this annual regatta season which is closed with Les Voiles de St. Tropez at the end of September. Who wouldn’t like to be part of this amazing spectacle and to enjoy exceptional classic yachts in combination with sun and sea? The agency for classic yachts, iSails Classic Yacht Charter, offers the unique possibility to partake in the first race of the classic yacht sailing season in Antibes, either as a single person, as a couple, or a group. On http://iSails.org , you can find a wide range of offers regarding this regatta: whether you prefer to book a classic yacht on a daily basis, wish to participate in the race itself or see the regatta through with a professional crew. Moreover, you can book a visit to a single event of the regatta or, for example, hold your teambuilding training on one of the yachts in Antibes. If you favor a more quiet participation of the race, there are also accompanying tours to the regatta where you can watch all race activities from a safe distance or, on the other hand, if you are an advanced sailing sportsperson, the regatta training provides an interesting access to Les Voiles d`Antibes. And when the sun is setting after all the action and excitement of the sailing day in Antibes, a cozy after race snack will get you in the mood for the exhilarating evening program in Port Vauban. We warmly invite you to the Cannes Film Festival! This year we proudly present to you a very unique and exclusive location for your events, accommodations, cocktail parties or meeting points: come on board of our splendid classic yachts! Our fleet includes the renowned Vixen II whose former owner is the legendary Hollywood movie star Warren Beatty. Follow Mr. Beatty and let yourself be seduced by Vixen’s dazzling 94-year-old history, her beauty, and her charm and charter her during the film festival in Cannes as a single person or with a group. iSails will fulfill all your wishes with this and all other yachts: whether you wish for a sailing trip from the port de Cannes passed the small bays of the Cote d`Azur or a fun regatta on the open sea, whether you would like to use a yacht as a meeting point right next to the Palais de Festival or as an accommodation at the port or in a quiet bay close by. Moreover, there is also the chance to throw a grand cocktail party on a yacht or charter one of our yachts with a full crew for the whole length of the film festival. You can book each of our yachts flexibly and tailored to you personal needs and wishes. iSails offers yachts in all sizes and can accommodate up to 50 people for meeting points, up to 30 for day and sundowner cruises and up to 18 people for overnight stays. Prices starting from 195€ p/P all in! Among others, we work closely with star cook Alwin van Burken who, for example, awarded the Dutch restaurant “De Bokkedoorns” with a star and who will spoil you with his culinary skills. While sun and sea enclose you, enjoy the glamour of the Cannes Film Festival with refreshing cocktails on the teak deck on one of our classic yachts. And who knows, maybe you will be sitting with a sundowner on Vixen II in the port de Cannes when Warren Beatty is coming to visit his bygone amour. The late summer sun illuminates the old harbor walls of Saint Tropez and reflects on the azure water of the Mediterranean Sea. The historic port of the former fishing village is filled with the most beautiful and classy yachts that have sailed from far away to join the sailing regatta “Les Voiles de Saint Tropez” and compete in strength, maneuverability, and elegance. From September 29 to October 7 2012, sailing and regatta fans gather in the small but prominent artists' village at the Côte d'Azur and celebrate the annual spectacle of the last Mediterranean classic yacht regatta of the season. No need to observe the show from a distance though- iSails offers the thrilling and lasting experience of participating in the race on an impressive classic yacht! Join as a skilled yachtsperson or as a newbie to the sailing and racing world in the fun of the regatta. Together with the experienced regatta crew onboard you can feel the excitement of the start of the race, the piloting around the regatta buoy and the adrenalin of reaching the finishing line! And you can decide the degree of your active participation and choose if you want to join only for one day or experience the whole regatta. If you are a group of 5 and more people it is worth to book a whole yacht, of course including the support of an experienced regatta crew on-board. Or do you want to feel the excitement of a regatta but rather as an observer than an active participant? In addition to active racing attendance iSails also offers the possibility to join the regatta on an spectator boat. This way you are still in striking distance of the racing and maneuvering classic yachts yet you can watch and relax and maybe use the unique opportunity to take breathtaking pictures or videos of one of the world's most significant classic yacht races! And in the evening the historic heart of Saint Tropez invites you to celebrate the ending of an eventful sailing regatta season and to enjoy the last sunny days of the year. Come join “Les Voiles de Saint Tropez” and feel the adventure and excitement of the regatta race on-board of a stunning classic yacht! Lone Fox wins over 68 Classic Yachts in Antigua. April 19th saw the end of the 24th Antigua Classic Yacht Regatta, the opening event of the 2011 season of the Panerai Classic Yachts Challenge 2011. The 68 boats registered represented a record number of entrants for this event, the most important of its kind in the Caribbean sea. The 1957 ketch, Lone Fox, took victory both in the Classics category as well as in compensated time. The owner, Ira Epstein, received the Panerai Trophy, a Radiomir Black Seal – 45 mm and an Officine Panerai barometer.